Grab an ice cold beer, sit back, and join Colonel Burns himself every Wednesday evenin' for a solid hour of hard drinkin', hard lovin', and hard livin' 1950's to present honkytonk favorites. "I have a term that is called “nos-otras”, and I put a dash between the “nos” and the “otras”. The “nos” is the subject “we”, that is the people who were in power and colonized others. The “otras” is the “other”, the colonized group. Then there is also the dash, the divide between us. However, what is happening, after years of colonization, is that all the divides disappear a little bit because the colonizer, in [their] interaction with the colonized, takes on a lot of their attributes. And, of course, the person who is colonizing leaks into our stuff. So we are neither one nor the other; we are really both. There is not a pure other; there is not a pure subject and not a pure object. We are implicated in each other’s lives." Lurking in the freeform ocean, adrift in the esoteric seas, diving to the depths of the avant-garde, and finding its' way back to the strange local waves of North Texas. DWAYNE AND CO-HOST JOSH BRING THEIR WEEKLY PICKS OF POWER POP, DISCO ROCK, NEW WAVE, AOR, NWOBHM, BUBBLEGUM METAL, AND PLENTY OF USELESS PRATTLE! Genre: INDUSTRIAL // NOISE // SOUND COLLAGE // POWER ELECTRONICS // MUSIQUE CONCRETE // TAPE COMPOSITION // AVANT-GARDE // DEATH ROCK // METAL // NEW BEAT // NO WAVE // NEW WAVE // FREE JAZZ // TECHNO // ACID // EBM // POST PUNK, AND EVERYTHING IN BETWEEN!!! DJ DREAMLOVER69 WILL BE BRINGING YOU A SLAB OF UNDERGROUND SOUNDS FROM HIS PERSONAL COLLECTION OF VINYL, CASSETTES & CD'S EVERY 1ST & 3RD THURSDAY FROM 10PM-MIDNIGHT. The Astro Altar hour becomes an open channel for mystical frequencies and archetypal resonances through the exploration of astrology synced with intuitively selected playlists guided by maps of the unconscious. With a mix of time bending genres,dust, ash, and dirt we might even dig into planetary patterns & dissect some retrogrades ℞! Adam Cooper and friends serve up a weekly themed mixtape with the assistance of the KUZU community. Music without Borders! / ¡Música Sin Fronteras! Music without Borders! spotlights indigenous music across landscapes. It honors history and people's struggle for human rights by transcending political borders with folk music created to share intercontinental memories. Género: Música indígena en las Américas  Música sin fronteras destaca la música indígena a través de los paisajes. Honra la historia y la lucha de los pueblos por los derechos humanos al trascender las fronteras políticas con la música popular creada para compartir recuerdos. Revisit: Music without Borders! /¡ Musica Sin Fronteras! Music without Borders! spotlights indigenous music across landscapes. It honors history and people's struggle for human rights by transcending political borders with folk music created to share memories. Género: Música indígena en las Américas Música sin fronteras destaca la música indígena a través de los paisajes. Honra la historia y la lucha de los pueblos por los derechos humanos al trascender las fronteras políticas con la música popular creada para compartir recuerdos. Rev Paul Roark takes you on a tour of the 78 rpm era, the sometimes scratchy-sounding records from the 1920's-1950's, with 78's from his collection and choice reissues. Jazz, blues, rock and roll, rhythm & blues, country, and more. A blend of local lo-fi music focused on fresh content and premier releases from producers of hip-hop, burger rock, indie, alt-folk, post-emo, chillwave, deathgaze and other ironically obscure genres thriving throughout the Denton, Austin and Houston music scenes. A broadcast pursuing a structural arrangement of the popular and the avant-garde in the auditory pathway, such that different tone frequencies and sun-drenched sensations are transmitted separately along specific parts of the structure. This is music that draws up plans to experience it in person. Tunes cut as bumpers to NPR programming, eliciting exclamations of "neat!" Thoughtful renderings in pencil to paper; algorithmic overlays; nights, days in agony over buggy programming; working details out in performance. Andy and Nic are suckers for a well crafted hook. Join them every Monday morning at 8 for an adventure down the pop road less traveled. Country, classic country, country rock, alt-country, Americana, Texas, Red Dirt, rockabilly, bluegrass, honky-tonk, Western swing, Canadian cowboy, and comedy. Program mix of soul, funk, doo-wop and jazz. Murderation highlights first wave mento, ska, rocksteady, dub, and reggae music from the island of Jamaica during the 60’s & 70’s. Minimum rocknroll, latter-day folk-punk, junior varsity college rock & other sundries. BandwidthTX is an exploration of music from around the world, highlighting talent from Texas (or with a connection to Texas) on every show. Mostly vinyl, sometimes digital, BandWidthTX airs the second and fourth Tuesdays of the month from 7-8pm CST on KUZU LP 92.9FM, Denton, TX or streaming live from anywhere in the world on kuzu.fm. Expect the unexpected from DJ LT. Sometimes a theme, sometimes not. Sometimes a guest, sometimes solo. Sometimes a laugh, sometimes a scream. Sometimes the sound of a cat purring, sometimes the sound of bees in a bedroom wall. Sometimes the wind, sometimes the rain. Never an elephant in the room, always a tiger. The 8 Legged DJ plays an eclectic mix--everything from punk to prog to jazz to metal to funk to psychedelic to folk to experimental to hip hop to soul, and more. Each set is a whole new ballgame. A limitless flow of music not restricted by style, genre, chronology nor geography. Songs and pieces that might be traditional, modern, contemporary, experimental, improvised, far out, cute, acoustic or electronic. A Tape of Two Cities takes listeners on a journey of dichotomies as each episode focuses on the music and attached culture of respective cities. This journey leads to new discoveries and a reflection on similarities. New episodes air on the 2nd Saturday of every month at 5 p.m.
Years ago, a friend was driving late at night through rural Louisiana. Scanning the radio tuner, she found mostly white noise. Eventually her search stopped and the dial landed on a station playing the chorus to the song Funky Cold Medina over and over again. Funky Cold Medina, Funky Cold Medina, Funky Cold Medina. For fifteen, twenty, and then thirty minutes it repeated with no explanation, no correction until the sound faded to static and she drove deeper into the woods. This program is for those who accidentally happen upon it. Exploring connections in the greater world of music. Curated by and filtered through the soul-soaked mind of an aging punk. Phantom Crush is a collaboration between Alizsha Kay and MOMWOW. Our radio show is scheduled for every first Friday of the month from 4pm-5pm. Dial 92.9FM on the radio or stream at KUZU.FM/streaming/. We will play our favorite jams, have interviews, sound collages, talking, and experimental performances. Tune in and chill out. Various genres and noise levels: loud-not loud, drone, found sounds and some not found, weirdo music-straight forward music, noise, ¡LOCAL!, ambient, poetry, things unheard and things heard, things you’ll like and things you’ll dislike...usually some really slick sounds. Every first and third Tuesday, One Hour Plateau will guide listeners on an excursion across a minimalist musical landscape. We will begin our excursion with an ascent composing of dance-able electronic beats. As we leave this urbanized metropolitan landscape the scenery will slowly fade away as the sound becomes more and more minimal, until we reach our plateau. At this point the show will transition into a nearly featureless landscape of chilled out, relaxing minimal ambiance. We will coast along this plateau until eventually descending back into "reality" as the music will begin to transition into live instrumentation, and eventually leaving the listener in a more familiar and tangible place. Please feel free to enjoy One Hour Plateau behind the wheel of an automobile, while studying, or just to unwind from a long day of work. Open your ears, relax your mind, and come join in for the ride on One Hour Plateau. Celebrating arranging in popular music. A mix-tape style rock and roll journey infused with narratives regarding personal experience, and nerdy illustrations of literary strategies and clever nuances of featured music. Themed shows will occur at the whim of the producer. The show will feature multiple genres, and will sometimes be themed. Wowzers! Don't miss KUZUthon 2! KUZUthon 2 invites new and old members to support the station by presenting an old school 80s telethon from our studio for your enjoyment. Featuring live interviews and performances from local bands, KUZU DJs, visual art manipulators, goofy skits, your favorite KUZUthon announcers, a tap dancer, accordion player, and much more! Tune in to KUZU on 92.9 FM! Listen online & Watch Live Video Stream at www.kuzu.fm ! Scouring the creases and crevasses of Texas music, 1836-Present. Weekly from 5-6pm on Fridays. Little People’s Jukebox is an all ages program of random pop, funk, and disco selections hosted by DJ EJ. 'Granny Takes A Trip' will feature 60's garage, psychedelia and bubblegum music from 1965-1969, almost exclusively. 'El Mundo' will be your weekly vacation around the world to explore the traditional and current music from our diverse planet. Early Rockabilly, Honky Tonk and Rock n' Roll that was made for cruising. Tonight will be a special Murderation dedicated to the Women of Jamaican Music. We will play femme hits all night and highlight the stories behind the often overlooked heroines of the scene. Selections from films to trigger forgotten memories. 'Meriwether Hour' puts regional music in the spotlight with a playlist featuring the best bands in North Texas. Expect interviews with local artists to learn more about what drives the local scene. 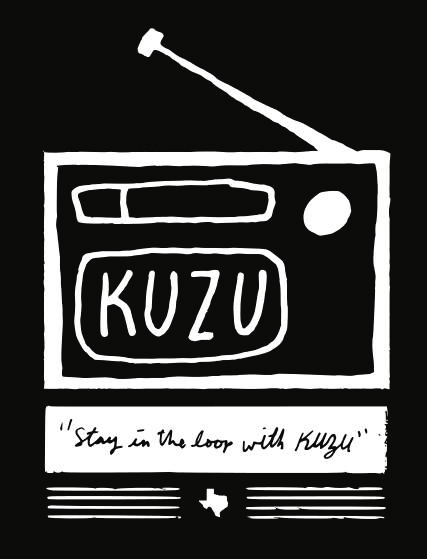 KUZU 92.9 LPFM -- COMING THROUGH THE AIRWAVES OF THE DENTON LOOP AND STREAMING WORLDWIDE! An electronic voyage with stops in IDM, underground hip hop, ambient and dance. All credit to Will King for this name that has tickled me for years. Boulez Campbell Soup sits at the intersection of pop art and contemporary composition. It has existed in various forms as an inside joke, listening party, series of live concerts, and exercises in wishful thinking. This is music that draws up plans to experience it in person. Tunes cut as bumpers to NPR programming, eliciting exclamations of "neat!" Thoughtful renderings in pencil to paper; algorithmic overlays; nights, days in agony over buggy programming; working details out in performance. FEM celebrates all female or non-binary musicians once a week with the goal to groove and educate the listeners! Genres ranging from the classic oldies, pop, r&b, punk, hip hop, indie, electronic, industrial, and more. This show playfully pits couples against each other while they exchange favorite musical selections and reveal their partner's guilty pleasures. Genre: Metal, Breakcore, Jungle, Hip Hop, Rap, Reggae, and Noise! 'Hot Rod Hour' is a weekly hour of old school rock & roll and local updates on vintage car culture. 25 artists' names go into a hat; 5 bands come out. $20 gets you into the drawing of the bands, an extra hearty breakfast by Chef Pam, and entrance into the show. $15 gets you into the show. Hour One: RL oral history featuring Will Johnson, Chris Flemmons, Dan Mojica and the event organizers. Includes live recordings from the first RL and beyond, with audio from the Seattle and Brooklyn satellite events. Hour Two: RL16 preview hosted by Andi Harman featuring music by RL16 performers Daniel Francis Doyle, Sudie, Pearl Earl, Thin Skin, Danny Diamonds and more! Come celebrate with us as we welcome YOU to the DENTROPLEX and become a Member of KUZU Community Supported Radio! Suggested Donation $5-$10 a Member and support KUZU forever! Constantly "sitting-in" for Big Dog and Barker, a fictional long-existing call-in show.